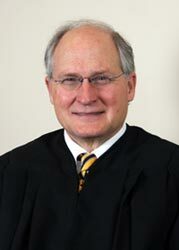 Chief Justice William L. (Bill) Waller Jr. announced today that he will retire on January 31, 2019. Chief Justice Waller was elected in November 1996 and took office in January 1998. He was re-elected in 2004 and 2012. He was a presiding justice for five years. He became Chief Justice in January 2009. At age 66, he enjoys good health. “It’s just time,” he said. The Governor will appoint a Justice to the District 1, Place 1 position on the court. The next election for the seat is in November 2020, and the next eight-year term will begin in January 2022. The position is one of two seats on the court with a 14-month delay between the election and the beginning of a new term. Mississippi Code Section 9-3-11 says that the justice who has served longest on the court shall be Chief Justice. Presiding Justice Michael K. Randolph of Hattiesburg, who joined the court in April 2004, is the second longest serving justice on the court after Chief Justice Waller. He has been a champion of meaningful access to the courts for all people. At his urging, free family law clinics for the poor have been held in every chancery court district in the state, with the largest number held in June. More than 1,000 hours of free legal assistance were provided to more than 600 clients through the work of more than 330 attorneys. His early priorities as Chief Justice included expanding drug courts to all 22 circuit court districts, which was accomplished in 2012. Drug courts have proven records of restoring sobriety, saving money on incarceration and reducing recidivism. At the end of FY 2018, there were 3,283 people enrolled in felony drug courts, saving the state millions of dollars in incarceration expenses. The 482 people who graduated from drug courts this past fiscal year are much more likely to successfully re-enter society than those released from the general prison population. Also during this past fiscal year, 57 drug-free babies were born to drug court participants, 122 parents regained custody of their children, 108 obtained GEDs and 943 became gainfully employed. Chief Justice Waller has sought to bring about reforms in the administration of justice through legislation and rule changes. He led the adoption and development of the Mississippi Electronic Courts (MEC) e-filing system. The source code for the MEC system was secured from the U.S. Administrative Office of Courts without cost to the taxpayers, and Mississippi is today the only state authorized to use the program developed by the federal courts. All development and code modifications have been accomplished in-house. Today more than 5,400 attorneys are registered for MEC and are conducting court business via e-filing in 58 counties in chancery courts, 23 counties in circuit courts and in 11 county courts. By the end of January, more than 80 percent of the Mississippi population will be covered by MEC in chancery courts and 50 percent of the Mississippi population will be covered in circuit courts. Appellate e-filing began at the Mississippi Supreme Court and Mississippi Court of Appeals in 2014. In 2018, MEC began using servers in the Supreme Court Courthouse for processing and storage of trial and appellate court records, which was critical to support the secure, 24/7 operating environment required by court rules. Chief Justice Waller led efforts which gained legislative approval for the equipment and facility renovation. Chief Justice Waller served as a member of the Criminal Rules Committee which, under the leadership of former Justice Ann Lamar, studied and prepared the Mississippi Rules of Criminal Procedure that were adopted unanimously by the Supreme Court. The new criminal rules went into effect in July 2017. For the first time in the history of the state, every aspect of criminal proceedings, from arrest to post-trial motions, was covered in one comprehensive set of rules. He was principal architect of legislation which created the Office of Capital Post-Conviction Counsel, the Office of Indigent Appeals, and the Comprehensive Electronic Court System Fund that provides funding for MEC. Most recently, he provided leadership for the creation of a second county court judgeship for Lee County, primarily to address an overwhelming caseload in Youth Court. This was approved by the Lee County Board of Supervisors and adopted by the Legislature. He has supported funding for parent representation in Youth Court that has proven effective in reducing foster care placements. Chief Justice Waller has worked to make sure that the Judiciary is adequately funded and staffed and has adequate facilities. He provided leadership to the passage by the Legislature of the historic Judicial Compensation Reform Act of 2012. This promoted judicial independence by requiring independent review of judicial compensation every four years. Additionally, the pay raise was funded from sources independent of general fund appropriations. He was a member of the Building Committee that oversaw the funding, placement and construction of the Mississippi Supreme Court Courthouse in the design inspired by former Chief Justice Lenore Prather. The Courthouse was dedicated in 2011 with former U.S. Supreme Court Justice Antonin Scalia providing the keynote address at the dedication ceremony. Chief Justice Waller has spoken to local boards of supervisors to encourage courthouse upkeep, renovations and security. One of the highlights of his tenure as Chief Justice was joining the Mississippi Bar and the two law schools in the state to commemorate the Bicentennial of Mississippi’s Judiciary and Legal Profession on Sept. 27, 2017. This included the participation of the Chief Justice of the United States, John G. Roberts, Jr., the third U.S. Chief Justice to visit Mississippi since statehood. Chief Justice Waller and his wife, Charlotte, have three adult children. They are members of First Baptist Church Jackson.